I think many of us are feeling vulnerable these days. Tragic world events shake us; political fighting unsettles us; wild winter weather keeps us on edge. On a personal note, recent changes in my own workplace have left me and many of my colleagues feeling disempowered. Being vulnerable takes a lot out of you. But tomorrow is the feast day of Our Lady of Guadalupe, and that makes me happy. Just like her son, she’s a champion of the vulnerable. She singled out the little guy, Juan Diego, and encouraged him. She appeared not to the wealthy and powerful but to a representative of the disenfranchised and vulnerable, reminding him of his own innate dignity. 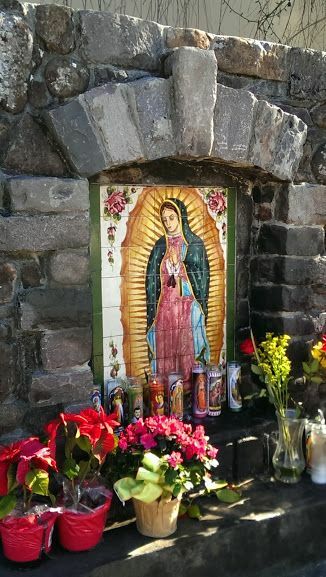 Here in California, you see many images of Our Lady of Guadalupe: on truck decals, T-shirts, sides of buildings. The fact that she is so ubiquitous just underscores her availability. You don’t need a ticket or a background check or a sponsor to approach her. She’s always there and ready to listen, any time life is roughing you up a bit and you need a little comfort. Years ago, walking with my husband after dinner at a restaurant in a nearby city, I remember passing a Catholic church. There was a shrine to Our Lady of G. in the parking lot, and in the dusk a young man was standing there. He was alone, and silent, just pausing in front of her shrine. It was clear that he was praying. I was touched by it, this moment where vulnerable human need sought strong maternal love. If my own experiences are anything to go by, I suspect he left that shrine feeling heard. I think this is why Our Lady of Guadalupe is so special. I think it’s why her image is fixed in our memories, just as surely it is on Juan Diego’s tilma. She keeps on bringing us roses in winter, affirmation in the bleakest times. And that’s worth celebrating, tomorrow and always. This entry was posted in Images of Mary, Uncategorized. Bookmark the permalink. What a beautiful and powerful image. And so needed right now. Thank you for this lovely post. It is so much needed. Brought tears to my eyes. I needed that. Thanks! Love this! Sorry about the work stuff… so hard.